Dr. Anna Perez is a tribal member of the Tigua Nation--one of three federally recognized Native American tribes in Texas and a resident of the federally-recognized tribal nation, Ysleta del Sur Pueblo, located in El Paso, Texas. 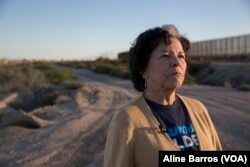 Dr. Anna Perez, a tribal member of the Tigua Nation--one of three federally recognized Native American tribes in Texas and resident of the Isleta del Sur Pueblo, looks in the direction of Ciudad Juarez, Mexico. Walking the rusty metal border fence 10 minutes from her home, Perez says she doesn't know how the extra troops will affect the town. Residents are used to a military presence since Fort Bliss, a U.S. Army post has its headquarters in El Paso. “I just want a secure border. … Just make sure that they're doing everything they can to keep us safe,” Ian Valdez, a 22-year-old El Paso resident and registered Republican, told VOA. 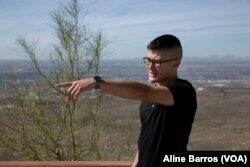 Ian Valdez, a 22-year-old El Paso resident and registered Republican, points to the direction of a nearby port of entry in the U.S. side. “I feel like we're welcoming to others, and that’s what I like about El Paso,” 26-year-old El Paso resident Melania Garcia told VOA. 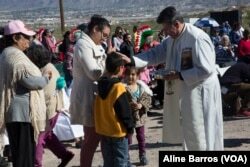 Children receiving blessings from a clergy man at the annual border mass on Saturday at the border fence in the Anapra area of Sunland Park, New Mexico. She is working on a rooftop space for the house she designed so she can see the border - and beyond - from there.